Wow! Before I start to tell you anything about the brand, the product or the packaging or anything else I just have to say – I love how this Zuzka Argenine Hydroxy Rejuvenating Cream makes my skin look! If you are a similar age to me you probably do that thing in the mirror where you use your fingers to lift the skin on your face to make it look tauter. Well once this cream is on, I don’t need to do that. I mean really and it’s pretty much instant! Now that blew me away! It isn’t really one of the product’s claims but that makes it all the more amazing. It’s one of the reasons why over time I’ve started to try products and then read the claims afterwards. Otherwise you see what you expect to see. So now back to where I would normally begin – Zuzka Natural Beauty is the creation of Susan Kohutova a qualified Beauty Specialist & Registered Medical Herbalist. This range of natural cosmetics is free from harsh detergents and synthetic ingredients. Studying Medical Herbalism provided the in-depth knowledge of herbs, plants and flowers needed to create a cosmetic range that utilises precious natural ingredients to their best potential. Only certified organic herbs, plants & flowers free from pesticides & chemicals are used in Zuzka cosmetics. So what was my experience of trialling this product? Well, to be honest I didn’t want to like the product. It wasn’t a brand I’d heard of and it came to me in a sample size so I wasn’t sure that I liked the packaging. Then I didn’t really like how it smelt or how it applied. It sinks in and dries quickly which I wasn’t expecting. I know you probably think I’m being fussy but I try a lot of products and I know what I like. Then as I put on the rest of my beauty products (I used this as a serum substitute under my usual moisturiser) I noticed the effect on my skin. I did the lifting skin-tautening test and – well = I was sold! That was on the first use! So I don’t care about the smell – it fades anyway – and I can see the full size packaging is lovely. Here’s a pic (the sample is in the photo above). Let’s face it – it’s the outcome that’s the real test of a product’s worth and this has exceeded all expectations. It costs £36.99 for a generous 50ml pot. 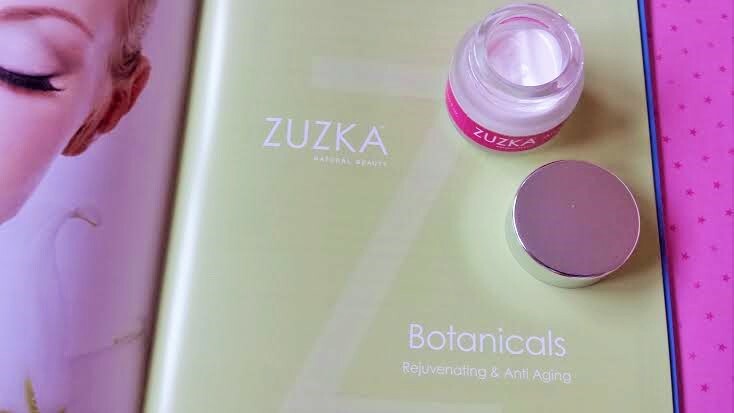 I have another product from Zuzka to review soon – and I have high hopes for it so keep your eyes peeled. Have you heard of this brand or used it before? I’d love to hear what you think. Next postStrand On Beauty’s 1st Blog Birthday Giveaway!